Polyurethaneunique bushings are designed to never wear out as conventional bushings do. They are self lubricating, never squeak, are weather resistant and produced using the latest polyurethane materials. Replace your original body mount bus hings with these new polyurethane style bushings and eliminate the problems often associated with soft or worn rubber body mounts. Includes bushings, sleeves and hardware to replace all 4 front subframe and 2 radiator support mounts. Application Notes: For 1973-75 Firebird models with 1" hole in radiator core support use part # 34157. 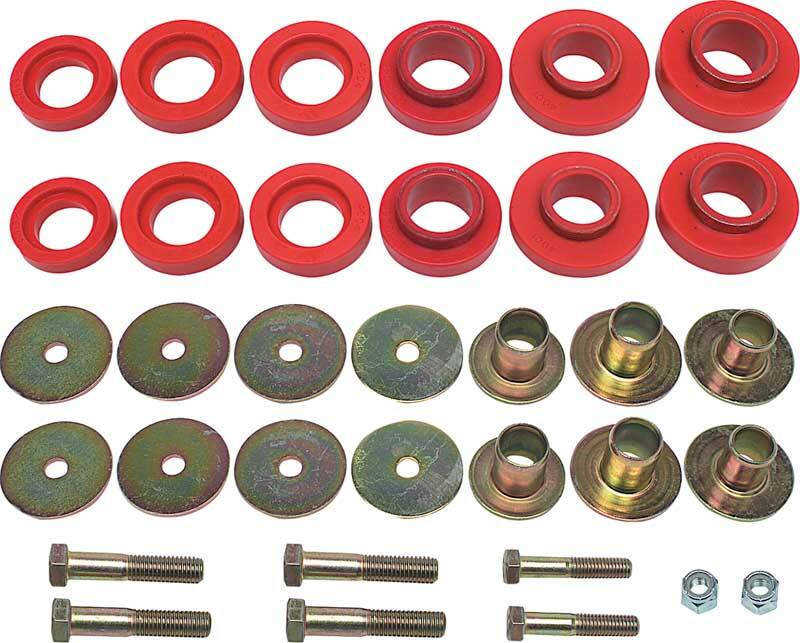 1967-81 Red Polyurethane Body Mount Bushing Set is rated 5.0 out of 5 by 1. Rated 5 out of 5 by piecesof8 from simple to install I've used this on many cars with no issues, great handling.